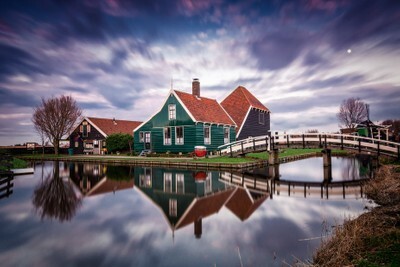 This photo was taken in Zaanse Schans (Netherlands). A little and magic village. The best time for shooting, sunset. At the blue hour the tones and light comes beautiful and colorful. A decent camera nikon d7100 and Tokina 11-16 2.8 lens. As well as a tripod and nd filter. Simply the village inspired throughout its roads, streets, houses... just need to be there and look around for feel the place. Some retouching about darks and lights, contrast and colors, not to much but also necessary for improve the photo. All range lens, nd filters, and cleaning equipment is necessary. You just need wait for the correct moment, patient and happiness.